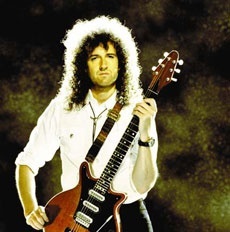 Brian May Says Queen: Rock Band "May Happen"
Queen guitarist Brian May has expressed interest in doing a Queen-dedicated version of Rock Band and says discussions about making it happen are already underway. With over 300 million albums sold worldwide, it's hard to argue that Queen isn't a hugely successful band. According to the Guinness Book of World Records, Queen albums have spent a combined 1322 weeks - that's 27 years - on the U.K album charts. The band's Greatest Hits has actually outsold the Beatles' classic Sgt. Pepper's Lonely Hearts Club Band in the U.K. by well over a half-million copies. In that light, then, a Queen-based Rock Band game doesn't seem so unlikely and May recently told the BBC it could happen. Discussions about bringing the game to life are "going on behind the scenes," he said, adding, "Yes, we're into it. I think it may happen." May is already on the verge of being immortalized in the digital realm: He's appearing in Lego Rock Band, which comes out next month, and his enthusiasm for the genre is clear. "It's the ultimate accolade, to be portrayed in Lego," he said. "My dreams are all fulfilled now." I like Queen but I have to admit that I'm not completely sold on this idea. May could probably speak more authoritatively on the matter than I (he's an astrophysicist with a Ph.D., after all, while I'm pretty much a high-school dropout) but is there really enough material, with enough wide-ranging appeal, to support a game similar to The Beatles: Rock Band? I could see something along the lines of Guitar Hero: Van Halen, maybe, but anything more than that seems like an awfully big reach.